I was very excited when I learned the news that this place was about to open in Jakarta, because the name SOULFOOD somehow seems to promise a wholesome, unpretentious and delightful dining experience, oldies Indonesian style. A bit of history lesson here, the word 'soul' has been a casual reference to things related to African American cultural group. Being historically known to be less privileged compared to the fair-skinned communities, the African Americans eat mostly unpretentious, manually prepared food using whatever ingredients that can be acquired immediate to their surroundings. 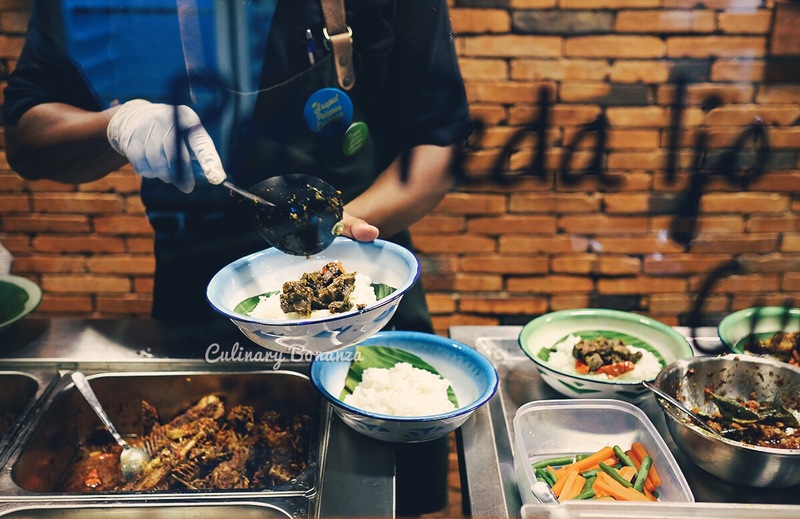 SOULFOOD Kemang, is entirely different in the type of cuisine (it's Indonesian instead of African American), but it is similar in that the food is unpretentious, comfort food and made with the best ingredients that's immediately available in Indonesia. By immediate, it means that the ingredients are (mostly) locally sourced and produced by Nanduto and her team. (Nanduto is a lady, by the way, I was misled by the name too at first!). SOULFOOD Kemang is the latest project by the same people who run Koiki Eatery at Senopati Suites, which I visited quite some time ago. The front part of the restaurant is a retail space dedicated to display the various products made in-house, such as: Nanduto's cooking Sambel (Sambel Jambal Merah, Sambel Peda Ijo, etc), other sauces / dips like Jalapeno Garlic Oil, Cheese Dip, Coriander Mayo, and bottled drinks (Es Kopi Londo, etc), crackers (tortilla, potato chips, etc). It's definitely a heaven for sauces/dips fans (just pray that they don't run out of the products when you visit, because currently the central kitchen is still located in Jogjakarta, so product replenishment may not be as fast yet, until they finally move the kitchen to the upper floor of the restaurant. 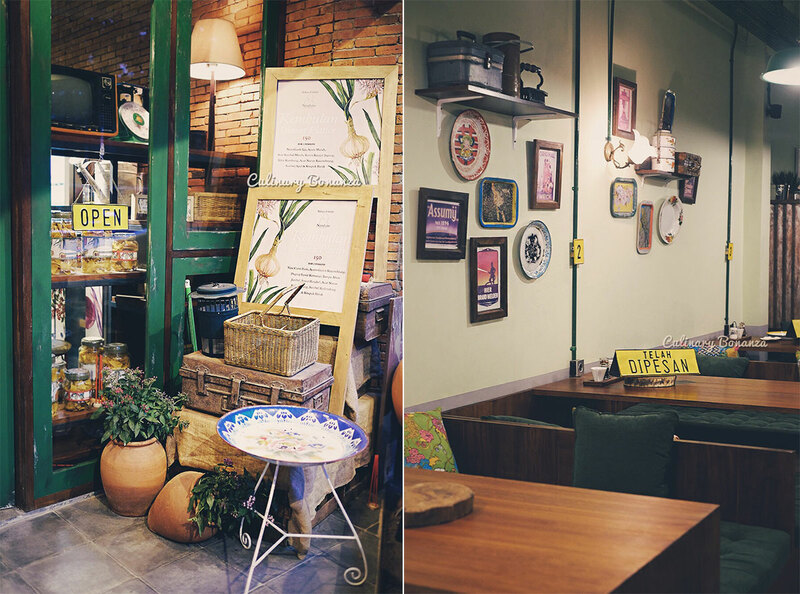 The restaurant itself is furnished and accessorized with assorted vintage ornaments that once existed in the homes of Indonesians back then. Even the music playlist has been curated to match the ambiance, in the background guests will be accompanied with a medley of songs sung by Indonesian artists from the bygone era. The restaurant's comprises 4 floors, the Basement is accessible to Staff only, the Ground Floor is the main dining area, divided into 'Lesehan' row and normal table and bench row, 2nd Floor will be open for Private Dining concept (still on progress) and 3rd Floor will be the Central Kitchen. The menu is printed on vintage tin trays, the kinds painted with colourful flowery pattern. It's so creative, right! But what excited me more, was what's listed on the menu. 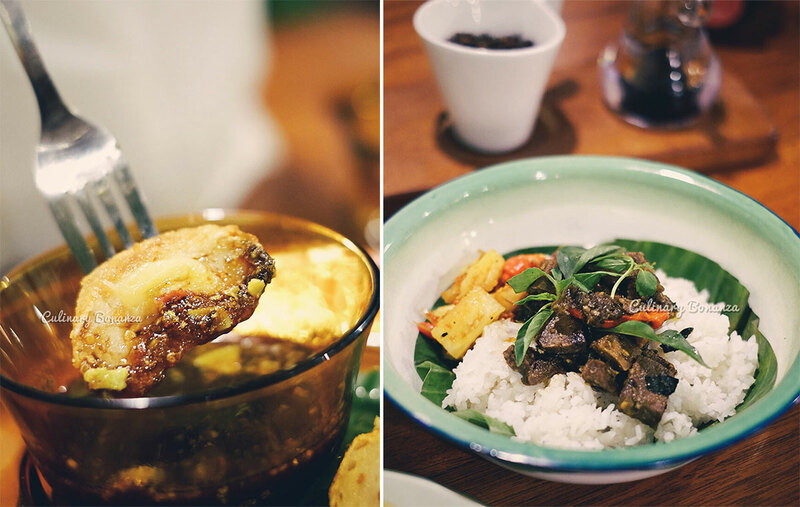 I saw a number of classic Indonesian dishes, while some are actually served with a modern twist. It's not a massive menu, but more than enough to fill your craving for spicy, rich, bold-flavoured and carb-loaded Indonesian food. (Absolutely recommended!) Kembulan Dinner Platter IDR 150,000 - Nasi Gurih Iga, Ayam Merah, Ikan Sambal Matah, Tumis Kecipir Jagung, Telur Kembung, Acar Nanas Kecombrang, Sambel Apel & Krupuk Barak. Kembulan is basically a platter that's good for 2 persons to share, consisting all the good stuff Savoury Ribs Rice, Boneless Chicken in red sauce, dory fish fillet with Sambal Matah, Winged Bean & Corn Stir-Fry, Pineapple & Torch Ginger pickles, Apple Sambal & White Crackers. This was my favourite, a must-try if you come here! Incredibly tender stir-fried ultra spicy Beef Tongue in green peda sauce and served with pineapple-torch ginger pickles. Enak! 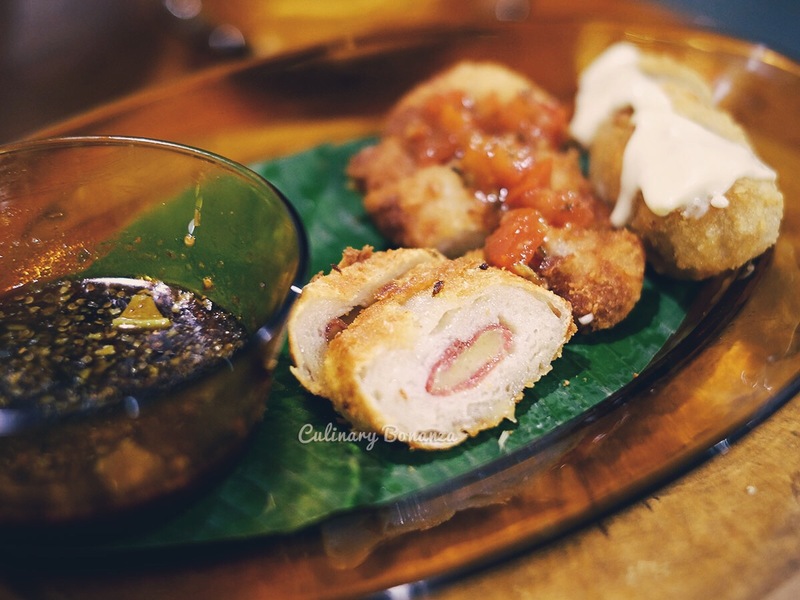 It's a twist of Indonesia's beloved Pempek Palembang or fried fish cakes. The twist lies in the fillings in each of them, I won't spoil the surprise, but I can tell you I really enjoyed this. The fish cake alone is richly savoury, but if you need extra spicy kick, you can dip it in the sweet vinegar sauce that came together. Indonesian's classic soup-y delicacy, the beef balls come served with yellow noodles, fried meatballs, and beef skin (kikil). Assorted Traditional Kueh 'Manis-Manis': Klepon, Balapis Pandan, Balapis Coklat, Kue Mangkok, Lupis, Putu Mayang, Bugis. My favourite were the Balapis Coklat and Putu Mayang. 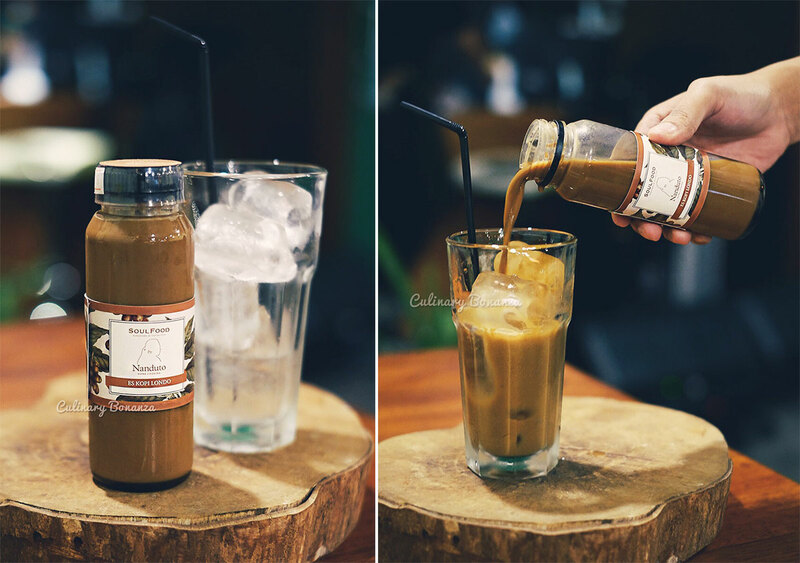 Indonesian style kopi tubruk with sugar, milk and a hint of cinnamon in it. I personally like this place and I would show my guests from out of town to eat here. Not only does the food taste good and it offers a 'hipster' kind of oldies Indonesian feel, my guests could even bring home some of the goods sold at the retail section to bring home as gifts. So, it's like hitting two birds with one stone ;) I really look forward to the next surprise when Nanduto is finally ready to open the Private Dining concept.